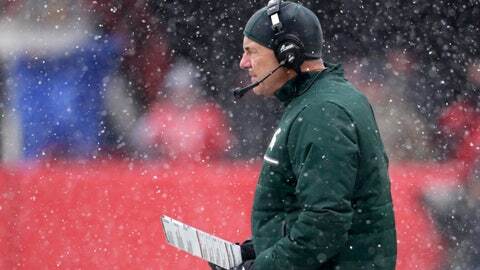 EAST LANSING, Mich. (AP) — At times like this, when Michigan State is dealing with a disappointing game or season, coach Mark Dantonio sometimes becomes philosophical. That was certainly the case Tuesday. When asked whether his team has underachieved this year, Dantonio went on for more than 3 1/2 minutes, discussing injuries, the Spartans‘ offensive struggles and his players’ academic performance. A season that began amid high expectations is winding down with a bit of a whimper. The best Michigan State can hope for now is a win over Rutgers in Saturday’s regular-season finale, followed by another victory in a bowl. That would give the Spartans an eight-win season. Michigan State has lost two straight games and did not score a touchdown in eitherone . The Spartans (6-5) are already bowl eligible, so this won’t be as bad as the 2016, when they finished 3-9. But after winning 10 games in 2017, Michigan State appeared to have regained its recent status as an elite team in the Big Ten. This season, the Spartans have been good on the defensive side of the ball — and that hasn’t been enough. Injuries have certainly played a role, affecting every aspect of the offense — and special teams as well. Quarterback Brian Lewerke, running back LJ Scott and wide receiver Felton Davis are among the players who have missed time for the Spartans. Dantonio said he’s not sure if injuries cost Michigan State games, but it’s certainly possible the team could have played better if it had been healthier. Instead, the Spartans fell out of the conference title race and are having to find other ways to motivate themselves, now that their loftiest aspirations are out of the question. Dantonio hopes his program still has a solid foundation. After all the success Michigan State has had under Dantonio, the difference between six wins and eight may not seem like much, but he clearly believes it’s important to finish 2018 on a strong note. NOTES: Dantonio said WR Brandon Sowards, a fifth-year senior, is planning to apply for an extra year of eligibility. He missed all of the 2017 season because of a knee injury.